Giddy yap, giddy yap, let’s go, ladies! The new event in Lady Popular is here: Christmas Teleport. Christmas is the best part of the entire year and not just because of the presents! Having some time off, eating grandma’s cookies, sitting around in your pyjamas all day and watching Christmas movies it’s so amazing! We can’t have Christmas in Lady Popular without а Teleport event so get ready for some real outdoors fun! Yes, you heard us right – we are going outside! 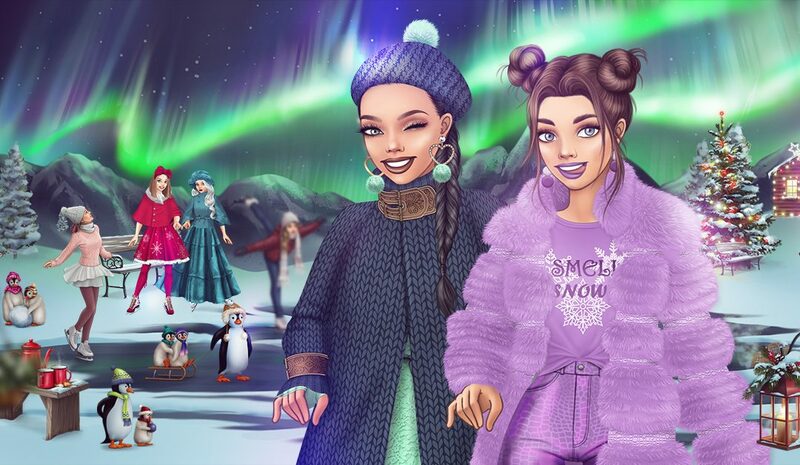 Put on some warm boots, grab your coat and call all your friends – we are going ice skating! “?” – means that there’s a reward in a field nearby (it can be either in the square marked with “?” or in some of the 8 squares surrounding it). “X” – means that there isn’t a reward in the fields nearby (under the square marked with “X” or the surrounding 8 squares). Remember that you can stay in a zone for a limited time (8 hours). After that, you will be returned back and all the opened fields in the zone will be reset (closed). If you haven’t found all the rewards from the chosen zone, you can enter it again. You can travel again within the same day by paying with diamonds. If you can’t wait for 40 minutes until your next free try, you can open a field by paying with diamonds. Do you like it? Which is your favorite outfit?